Following after the 'Joe draws the Teen Titans in his own style' posts, I thought I'd continue on with some other comic book character drawings. Rather than remain with the superhero genre, I thought I'd branch out to some of my favorite indie comics. 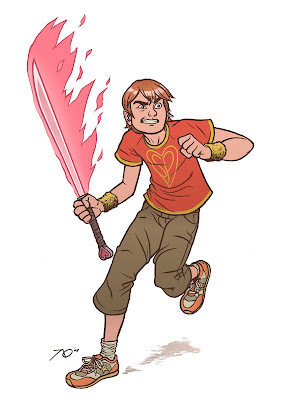 Here then is the character 'Scott Pilgrim,' created by Bryan Lee O'Malley. Obviously if you haven't yet read this amazing series, I expect you to head out to your nearest comic/book store immediately. yessssssssss. just read book four and it rocked my heart. Love the book and this is a great rendition sir! i love Scott Pilgrim very dearly. i think a lot of artist are gooin to benefit from Mr. O'Malley's work and the world is a better place because of it. this is an great drawing of Scott Pilgrim. beautiful work.